We all know babies don’t pay attention to things like due dates. Sweet Tillie was no exception! 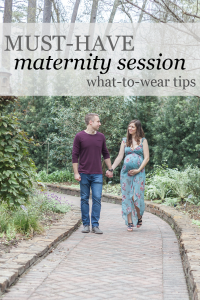 Megan and I carefully planned out a gorgeous maternity session together. I had two of my studio gowns ready to go, along with an incredible bouquet of white roses full of wide open blooms. The weather forecast was perfect – sunny with a high of 60 – guaranteeing that our sunset session in a Houston-area botanic wonderland would be incredible. Three days before her photos, my pre-session checklist was complete and we were all set to make magical memories of her pregnancy. And then Megan’s husband sends me a text saying that Tillie is on her way – at only 34 weeks! 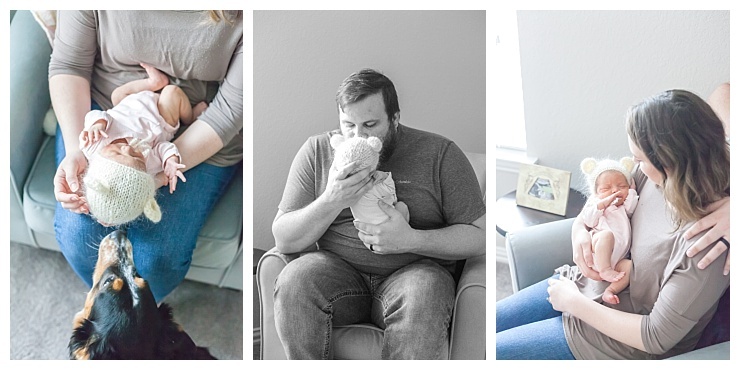 And just like that, Megan’s maternity session turned into a celebration of her brand new baby girl! Tiny Tillie spent a few weeks in the NICU. Just over a week after she came home, we celebrated her one month birthday with a beautiful in-home newborn photo session in Conroe, TX. Megan and Kyle created a gorgeous nursery for their daughter, complete with a stunning gallery wall and lots of personal little touches. It was such a peaceful room with perfect natural light, so we photographed mama and baby there first. 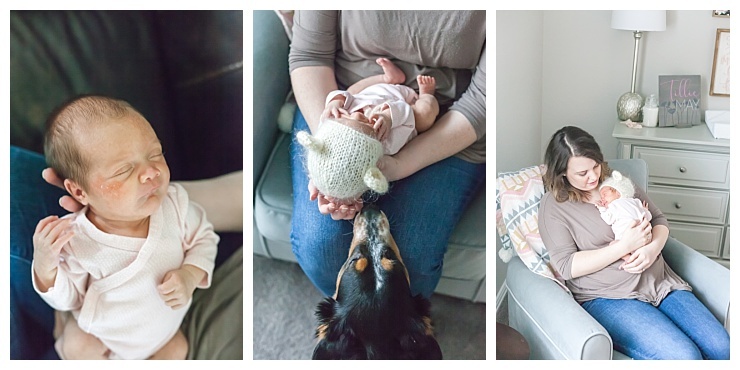 Megan had a couple of outfits selected for this sweet at-home newborn session, which is great because it adds more variety to her photo gallery. She started out in a casual pair of jeans and cute, neutral-colored top that made nursing a breeze. I loved that she chose this outfit because when they look back at these photos in 5, 10 and even 20 years, Megan and Kyle will recall these early days of life with a new baby, exactly as it was. Megan cuddled with Tillie in her comfy chair in the nursery and then we invited Kyle in for some family-of-three shots. The moments with just Kyle and Tillie were especially memorable. I love working with new dads to help them celebrate fatherhood. With mamas, our goal is to show the deep connection between a mother and her baby after nine months of pregnancy. 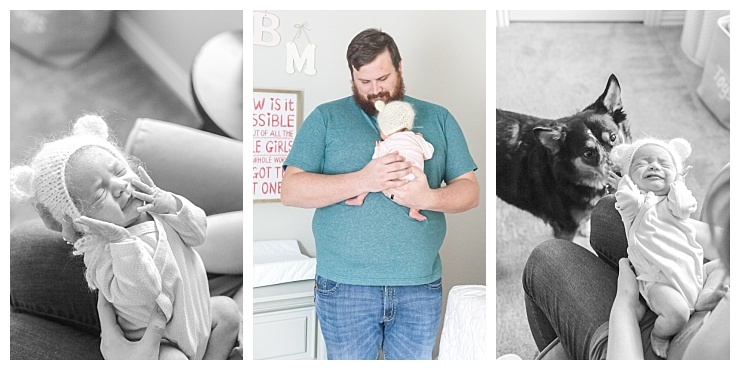 With dads, my goal is to show how he can be both strong and tender, and the contrast between baby’s tiny body and his big hands. Next we moved into the master bedroom for a few more mama and baby photos. The neutral colors of this room were a photographer’s dream come true because they allow mama and baby to shine. It was also the perfect spot to capture the whole family – puppies and all! 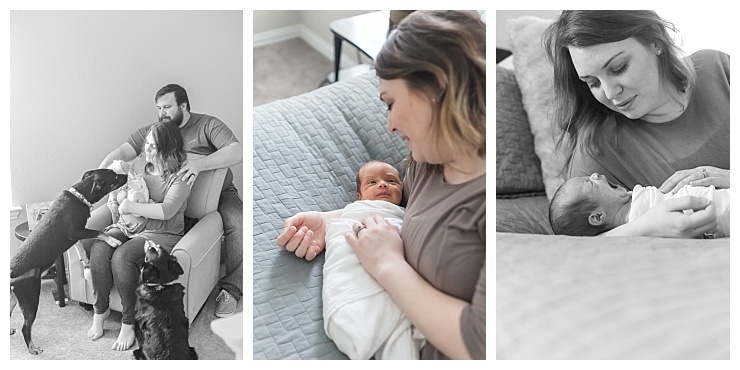 We moved back into the nursery with Megan in two different outfits to wrap up this two-hour in-home newborn session. Her plaid long-sleeved tunic was a perfect choice for a November photo session. This is when we worked in a pink tie worn by Megan’s late grandfather, which she held while cuddling with her sweet baby girl. My favorite images of mama and baby are the last few we took during this amazing Sunday morning session. Megan changed into a beautiful floral green dress from Old Navy and I snapped some of her both side-lit and backlit in front of Tillie’s nursery window. 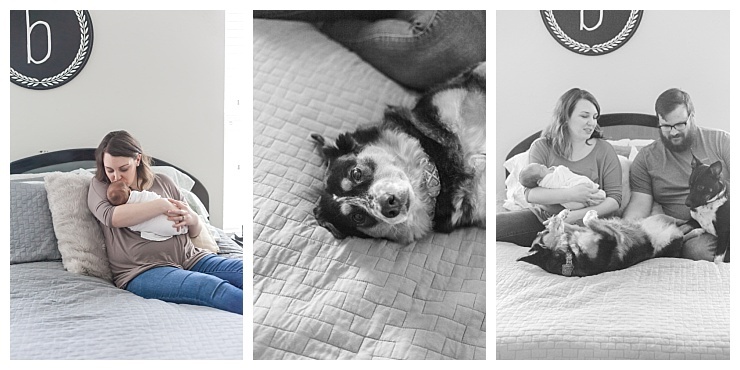 These last few images are especially moving because they perfectly illustrate the deepness of a mama’s love. You can just see how motherhood and her love for Tillie has transformed Megan. 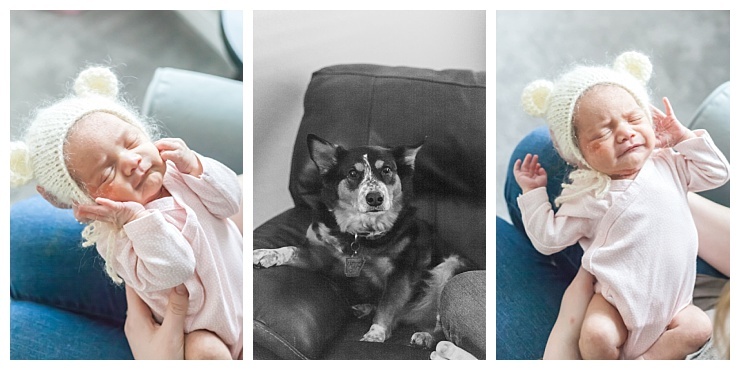 At one month old, Tillie and her parents have had already had quite an adventure. From pregnancy that ended abruptly – but happily – at 34 weeks and a brief stay in the NICU, Megan and Kyle have had an exciting introduction into parenthood. They couldn’t be happier to begin life at home with their daughter.